These butternut squash resulting from composting in place kitchen refuse were photographed on March 25, 2018. This is a photograph of the same butternut squash photographed on June 28, 2018. This gourd photographed on June 28, 2018 is a typical specimen among many. Clearly the composting in place hügelkultur is producing prolific results. 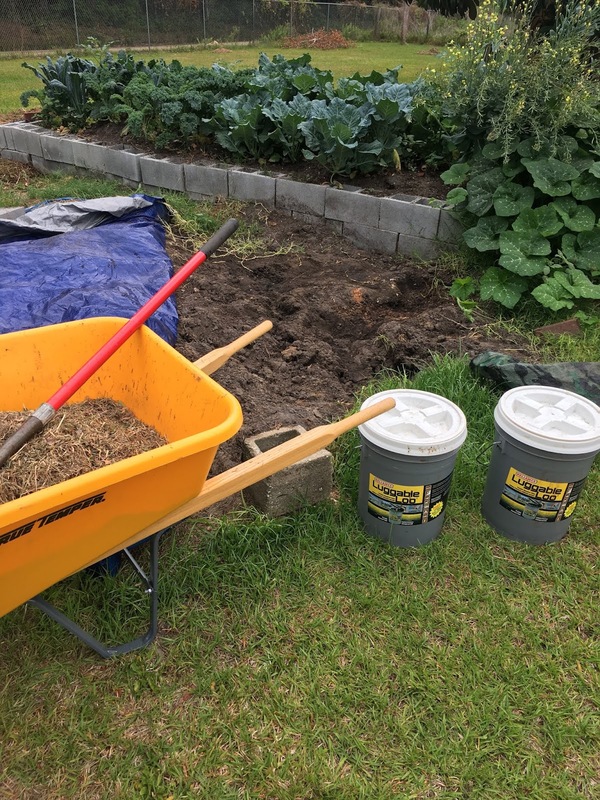 The consummate collection of my urine and feces complements the hügelkultur by insuring an abundance of rich compost can be continuously applied. This collection of grass mulch is mixed with soil, my urine and my feces. I don't eat meat, age my compost, and the waste collection/produce consumption are exclusively mine so typical "night soil" concerns are irrelevant. I collect my feces and urine in two "Luggable Loo" containers which have been modified with screw on Gamma seal lids. Gamma seal lids contain odor completely, which is far better than the toilet seat like lids that come with the Luggable Loo. The stock Luggable Loo lids are flimsy and break quickly. The sitting experience of a Gamma seal lid is by no means comfortable, but if I were to do it again I would purchase cheap regular five gallon pails and Gamma seal lids. The premium Luggable Loo price for what amounts to no more than a broken toilet seat lid with severe odor issues is a complete waste of money. This two pail system has been refined over time. One pail is used for urine collection and one for feces collection. In this way as the urine fills up the pail, one does not have to concern oneself with splash back. Also a much smaller plastic yogurt container is used to capture the urine. This smaller plastic yogurt container approach has two advantages. 1) aim and splash are eliminated as issues, and 2) the Gamma seal lid is removed and replaced much quicker with minimal odor escaping than if standing and urinating with the Gamma seal lid off. Paradoxically odor is muffled naturally on feces collection because a natural odor seal is created by sitting directly on top of the pail while the Gamma seal lid is removed. Splash back is of no concern with relatively dry feces so sitting directly on the pail is not an issue and the very nature of sitting directly on a Gamma lid insures a prompt session. A permaculture, kitchen garden, hügelkultur provides a portion of my food. As opposed to a traditional kitchen garden, this kitchen garden's purpose is to exploit the intentional close proximity of the kitchen for "composting in place" kitchen refuse. The venerable nutrient staples spinach, kale, and collard greens are deliberately cultivated due to their continual harvest availability over a relatively long zone 8 time frame. 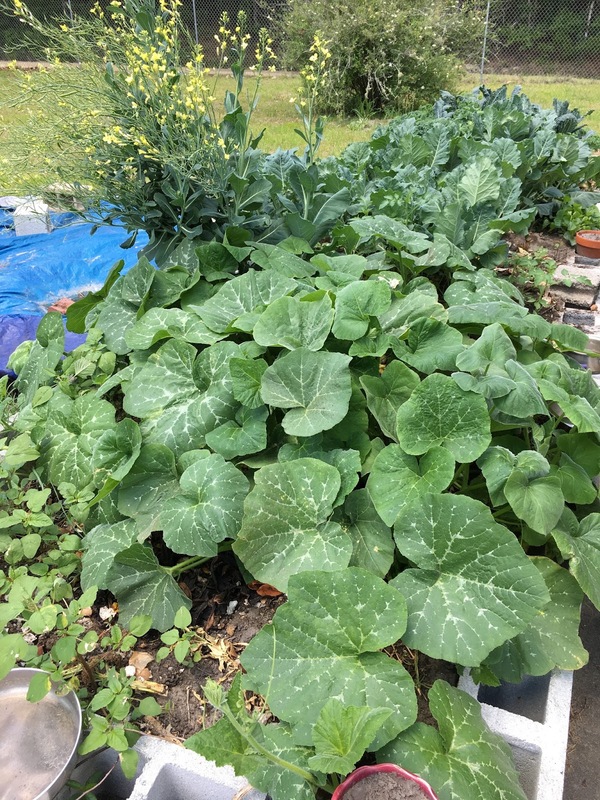 However other produce such as butternut squash, cherry tomatoes, etc, etc are arbitrarily cultivated due to the nature of permaculture and composting in place kitchen refuse.